It’s a somewhat salutary experience for someone who likes to think that they know quite a lot about music to be presented with a disc as fine as this by a prolific composer of whom I have never even heard the name let alone a note. If the price of being able to hear it is to feel rather humbled ... I'm happy for the humbling! 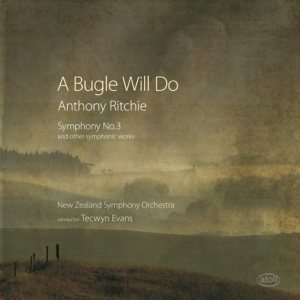 The name of New Zealand composer Anthony Ritchie was new to me, as indeed I expect it will be to many in the Northern Hemisphere. That being the case, this disc would seem to act as an excellent calling-card for his orchestral music at least. I say ‘at least’ because Ritchie is clearly a prolific composer having passed the Op.150 barrier with the Third Symphony recorded here and going strong. Apparently the two earlier symphonies have also been committed to disc - Kiwi Pacific CD SLD-115 - but I am not aware if that has been reviewed on this site. If not, on the strength of this disc they richly deserve attention. Importantly for a composer new to an audience this is a disc which serves him very well - a dynamic and committed New Zealand Symphony Orchestra play with all the energy and attack this eventful music demands. They in turn are served by a recording that conveys plenty of body and power as well as detail. The disc opens - sensibly - with an instantly appealing overture A Bugle will do. This work celebrates more than commemorates the achievements of New Zealand’s most famous war hero, Sir Charles Upham. By all accounts he was a naturally modest man so when, some years before his death, it was suggested that he would merit a state funeral his reply was that “a bugle will do”. Ritchie cleverly writes music that fuses celebration with elements of militaristic drum-taps within a web of cross-hatched rhythms that one quickly realises is very much part of the Ritchie signature style. This is wholly accessible music, flamboyant and exciting, similar in spirit if not musical vocabulary to Morton Gould when he wrote in a more serious vein. The structure of the work is very simple with two fast passages flanking a central panel of remembrance which has more of the sense of a funeral cortège. As a musical work it stands comfortably alone but for those who understand the significance of its dedicatee its music will have especial resonance. The resulting piece is a well-proportioned two movement work with the driving percussive “Up” sustaining momentum through nearly all of its thirteen minutes and the corresponding near seventeen minute “Down” exploring a variety of tempi within a realm of darker, more questioning music. My initial - by definition superficial - impression is that the second movement is where the heart and substance of the work resides. Perhaps the first movement had to exist because of the second and as such it feels a little less impressive. That said, the first movement is remarkable for the sheer compositional act of writing so much music of unwavering velocity. Yet for all the energy and sense of purpose it contains I find it strangely devoid of emotion - perhaps deliberately so. This does not seem to be joyful or angry energy - just speed, dare one say, for speed's sake. If there is a larger part for log-drums in the symphonic repertoire I do not know it! It’s a movement that impresses rather than moves. Certainly, that is an impression reinforced by the much more engaging and emotionally complex "Down". Here Ritchie explores a range of emotions via varying tempi with occasional backward glances to the athletic energy and thematic content of the companion movement. I should point out that this work was named "Winner of ‘The Supreme Achievement Award’ by The Listener magazine in New Zealand (2010)" - likewise this disc as a whole is/was a shortlisted finalist for Classical CD of the Year (in New Zealand one presumes). After the rigours of the Symphony another occasional Overture provides an excellent diversion before the closing work. The simply titled French Overture is no more or less than an attempt to write a baroque style French Overture - think the Bach Orchestral suites or the Handel Water Music Overture - but in the idiom of the late 20th Century. There is no programme, the orchestration nods in the direction of the baroque template with limited wind, trumpets and horns with timpani the only percussion. For any chamber orchestra looking for just such a curtain-raiser I think this is a bit of a winner. I was surprised, looking back, to realise that it lasts a substantial sixteen minutes - certainly it does not feel that long. It is packed full of interest and bustling contrapuntal writing framed either end with a suitably pomposo opening and closing section replete with timpani roulades and swaggering horns. Great fun to play too judging by the commitment of the orchestra. Also, one hears the quality of the engineering with the generous acoustic of the Wellington Town Hall giving a real burnish and sparkle to the heraldic passages and a richness to the tutti orchestra. This is a simple honest piece of absolute music - no message, no heart-searching just pleasure taken in the act of finely wrought composition. Much as I enjoyed - in differing ways - the first three works, it is the final work Revelations that I have found myself thinking of unbidden. Ritchie explains its genesis thus: "What happens to us after we die? This fundamental question has haunted human imagination for thousands of years. Many recorded accounts of ‘near-death’ experiences from all over the world provide evidence that human consciousness remains active in the time immediately following death. These independent accounts describe similar events: the person (or ‘spirit’) floating above their dead body, the appearance of a great light, being told to go back, and so on. In 1959, Gina Baxter-Leipolot underwent an emergency operation, was in a coma for three days, and was not expected to recover. During this time she had a ‘near-death’ experience in which she was drifting above a Mediterranean coastline. She heard music, such as the “velvet sound of violins, underbroken by a sound like mandolins” and “a humming sound, building up in force like thunder”. Gina remembered the music after she recovered from the coma and twelve years later she wrote the music down in a basic form, with the help of a retired music examiner, John Chew. She called the music ‘Revelations’”. Ritchie has taken that as really no more than a point of departure. There seems to be a clear narrative in this work. It opens with a great cry of mortal pain and the opening lurches its way through a morass of suffering. In many ways it struck me as a modern-day reconceptualising of Strauss's Death and Transfiguration. After some four minutes of groping upwards the music enters an extended fugato passage. I use the word fugato pointedly - in the original sense of flight - this really does feel like music casting off shackles and breaking free and thereby exulting in the freedom that now supplants the burdens so recently experienced. Again, the sense of gaining height is palpable until the clouds are burst through. There are two flurries of fanfares before Ritchie disarmingly incorporates the actual dream-music written by Baxter-Leipolot scored for celesta and harp. After the dissonant energy that precedes it the naivety of the melody - somewhere between a Malcolm Arnold English Dance and a Godfather theme - is an undoubted but highly effective musical shock. Gradually more instruments take up this haltingly simple theme before (again quoting Ritchie) “the piece is rounded off by a blaze of light. To quote Gina: “Don’t be afraid of death.”All of which is achieved in less than eleven minutes of music. This is a highly impressive work on every level and one that deserves far greater dissemination. Thus far in this review I have very carefully avoided any dreaded "sounds like ... reminds me of ...." analogies. This is for the very simple reason that Ritchie is his own man. There are times when musical gestures inhabit a similar territory - interestingly Britten sprang to mind more than once - the Peter Grimes Passacaglia and the Sinfonia da Requiem as well as the desolate landscape of a Shostakovich Symphony but it is important to stress that Ritchie possesses his own compelling personality. Interestingly Ritchie took a Ph.D. based on the study of Bartók (what aspect his website does not elaborate) but that is a composer whose sound is singularly absent from Ritchie's compositional voice. It is a voice both richly individual and utterly absorbing. The icing on the cake are Ritchie's own notes although oddly nowhere on either the disc or his own website is there a date of birth - or indeed much biographical information - so I hope that Wikipedia can be trusted in this instance! A hugely enjoyable and rewarding disc of a composer well worth exploring further.